Recently we wanted to print something from an old computer running Windows 2000 (yes, we have all kinds of dinosaurs in our office zoo) to a printer connected to a laptop that was recently upgraded to Windows 10. In the past, all we needed to do was to share the printer on the laptop, and then add it as a network printer on the Windows 2000 computer, and it would work beautifully. This time, however, when attempting to add the network printer to the Windows 2000 computer, we received the following message: "Windows cannot connect to the printer. Access is denied." We tried to do the usual troubleshooting: checked the security settings of the shared printer, checked the sharing settings, made sure that the file and printer sharing was enabled on the Windows 10 laptop, all was in order, yet the Windows 2000 computer was still denied access to the shared printer. If you don't know the network name of your computer, you can find it out as follows: right-click on the This PC folder (or Computer) in Explorer or some other file manager, and choose Properties from the shortcut menu. On that page, look for the 'computer name' text. That's the name you need to enter instead of 'laptop' in our example. Be sure to use the name of the computer that has the printer attached to it, not the one from which you are trying to connect to the printer through the network! 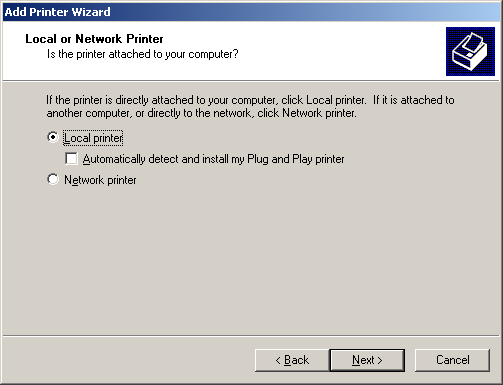 Next, Windows will probably ask you to select the printer make and model, install its drivers, etc. Keep providing the information that the wizard requires, according to your specific printer. When done, Windows should add the new printer to the computer, and you should be able to use it to print files. The procedure described above worked for us, hopefully it will work for you, too. 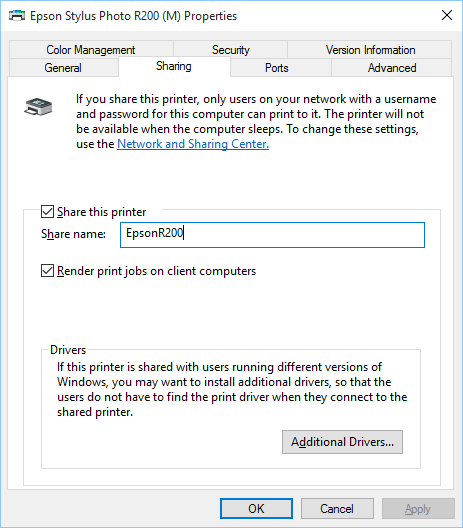 Worked for me to share printer connected to windows 10 with windows XP. I really appreciate you posting this. I had a similar problem when I shared printers on an 8.1 box and it took forever to find a solution. After upgrading 8.1 to 10, all the memories came flooding back. This and similar issues seem to be posted everywhere, with few solutions. I was getting mad about this problem until i saw your post! Este error me estaba volviendo loco. Gracias por tu post! After spending hours searching on the internet for a solution I finally found this post. Thanks a lot guys,worked perfectly! This solution worked for me. Thanks for sharing this with us! Thanks – I was going a little crazy with this! Worked great connecting an old XP computer to my new windows 10. Thank you for taking the time to share this solution. You are a life saver! Thank you! 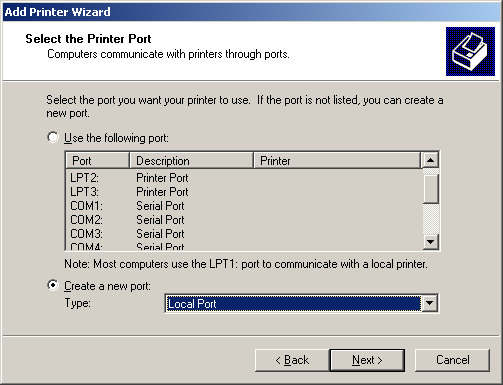 This worked perfectly to connect a HP LaserJet 1022 on USB001, Windows 10 to an older ASUS Computer still running well on XP. Thank you so much for posting this fix. This worked perfectly. I was at my last resort when I found your fix. Thank you again for helping. Thank you! I found numerous queries about this problem on the net. Yours was the only one I could actually understand. Nice. Worked well for me as well. Quick and clean. Of note: Our situation was similar in that we were previously able to print between the two computers, but when the Win 7 machine updated to Win 10 we lost it. Therefore when using your technique the Win XP machine actually recognized that it already had drivers for the printer, so no new drivers were required. Small favors. This worked perfectly for my situation (Win XP trying to connect to the printer connected to a Win 10 computer). Everything I’ve tried so far yielded nothing. Even though my computer was a Win XP, the steps were essentially the same. I wanted to thank you so much, for providing a real solution. Be Blessed. Has anybody tried oposite way? My printer is connected to xp machine, and my laptop win10 can’t get connection. I have other machines on the network running xp and win7, all prunting without problems. windows e seu modo de ser seu prórpio concorrente, por isso que esta perdendo tantos clientes. obrigado pela ajuda. Didn’t work. in step 4 after entering details in Portname window and click Ok. access denied pops up. After a long and painful Windows 10 upgrade, having performed this same procedure before and having my printer working fine (good advice, thanks), it stopped working. The error message is as follows: “Network path not found” or something like this, since my OS is in spanish. Any ideas? Shown in the instructions above. Thank you guys. Worked like a charm! you sir are the best :) thank you very much XD it worked. This was indeed a life saver. Thank you so very much! Thank you so much for this. Googled and tried so many solutions, but nothing worked. This worked on the first attempt. Thank you so much… Cheers!!! Fabulous answer – not found anywhere else, and Microsoft doesn’t know about it!